Cisco Suarez versus an entire Caribbean drug cartel. Round one. Fight. Okay, not exactly the most even championship match, but it's the one I drew. If you told me months ago I'd be robbing drug dealers, I would've committed you myself. Who needs that kind of trouble, right? The good news is I'm only after one man: Connor Hatch. The bad news is he's the new Pablo Escobar, a primal being, and all but untouchable. It gets worse. He's rounding up the Russian mob for something big, and I'm not the only spellslinger in the picture. They say follow the money or follow the drugs. Maybe I should keep an eye on who's following me. Some problems call for a delicate hand. I don't have those kinds of problems. 5.0 out of 5 starsIf you like gritty urban fantasy with compelling, complex, flawed heroes, you're going to like Cisco. 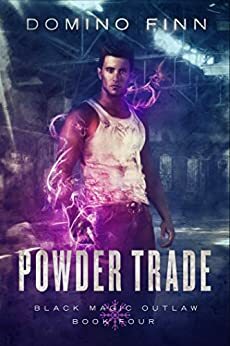 If you're looking at this review, then you're almost certainly an urban fantasy fan and you're wondering if this book, this author, this series could possibly deserve the comparisons it gets to the Dresden Files. It does. Finn has crafted a series that has earned him a place among the finest modern urban fantasy series; I'd put him on a shelf with The Dresden Files, Kim Harrison's Rachel Morgan series, and Kelley Armstrong's grown-up fiction any day of the week. I put him in that company, because that's where he deserves to be. Try it. If you like gritty urban fantasy with compelling, complex, flawed heroes, you're going to like Cisco. How can one man make so many bad choices? You'll have to read the book to find out. I read two of these books in one day. Either the stories are really good or kinda short. I'm going with short. I didn't find any problems with the writing of the story, just some of the choices that the MC made. I can recommend the book as it does full in the story nicely, but I feel the author is attached to his main bad guy and it's the only reason he hasn't died yet. We shall see in book five if I am right. I don't often leave reviews, only for books worthy of 5 stars to try and help Authors who deserve notice. This book is a fun read in a original Urban fantasy series. Start with the first book and enjoy the ride. Very interesting take on Magic, along with some diff magic monsters vs same old vamps and wolfs. Also enjoyed the Miami back drop as something new for Urb Fant. Do you know how it is when you are reading as fast as you can because the action and suspense gets your hear beating and you just have to see how the end turns out? Well that was me. Only I absolutely hated the end! So why did I rate the book 5 stars? Because the story was fantastic. In the notes at the end of the book the author says this will be a 5 book series, and the last book is not written yet. Well, get to writing and fix the horrible end of this book! Please. If you haven't read the Black Magic Outlaw series, I don't know what you are waiting for. Great plot, great premise, entertaining from start to finish! I wish the series continued past the last book, but I can tell you right now that you won't be disappointed in this series!